There are fundamental relations between three vast areas of physics: particle physics, cosmology and condensed matter physics. The fundamental links between the first two areas, in other words, between micro- and macro- worlds, have been well established. There is a unified system of laws governing the scales from subatomic particles to the Cosmos and this principle is widely exploited in the description of the physics of the early Universe. The main goal of this book is to establish and define the connection of these two fields with condensed matter physics. According to the modern view, elementary particles (electrons, neutrinos, quarks, etc.) are excitations of a more fundamental medium called the quantum vacuum. This is the new 'aether' of the 21st Century. Electromagnetism, gravity, and the fields transferring weak and strong interactions all represent different types of the collective motion of the quantum vacuum. Among the existing condensed matter systems, a quantum liquid called superfluid 3He-A most closely represents the quantum vacuum. Its quasiparticles are very similar to the elementary particles, while the collective modes of the liquid are very similar to electromagnetic and gravitational fields, and the quanta of these collective modes are analogues of photons and gravitons. The fundamental laws of physics, such as the laws of relativity (Lorentz invariance) and gauge invariance, arise when the temperature of the quantum liquid decreases. 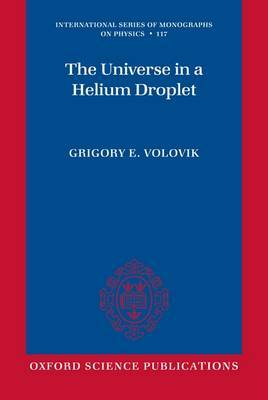 This book is written for graduate students and researchers in all areas of physics.